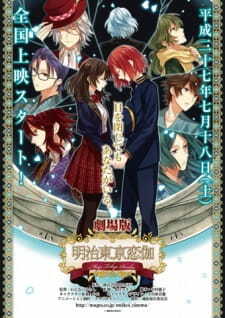 The PSP game and the Drama CD series Meiji Tokyo Renka, becoming a movie. I was quite curious what exactly they'd come up with and how they'd put everything together, but let me say this, it was the right choice of theirs to create an original story leaving most of the details behind. You know, character routes. They did give a little bit of the details, same as the beginning of the game, however, that was all, nothing way too specific. An original added story, there wasn't much of an action, things were more like progressing slowly. Everything starts with Mei chasing a black cat holding something (I really don't know what you call it even in my mother language...) and Izumi goes after her. Meanwhile a young man almost hits Mei with his car. He gets off and asks if she's okay and he could give them a ride home. In the end he offers them to pay for the transportation home. This is where Mei asks if 1000 yen would be okay, which wasn't of course, because back in the day 1000 yen would cost her 3 meals of beef bowl a day for at least 18 years. But he accepts it and gives them the money. The story starts after they want to give back the money because it was too much. Kawakami even jokes about it like "maybe you're a rich lady after all" since she requested that kind of amount. The introduction starts interesting, but the ending just feels like it was cut off. There is this after taste where I felt like "IS THIS ALL??". Turns out there is an another movie as well, maybe they're connected. I am not sure, so I won't say things I cannot guarantee, my apologies! Edit/Note: The 2nd movie exactly continues from where the 1st movie has ended. So yeah, they're connected. Gotta say, kind of relieved! Other than that, it was pleasurable. Wish we could dig deeper to see more of what the characters have, but hence this is a movie, there is a limit of what they can present, I thought it was well-planned. Voice acting was on point, as always. I especially appreciate the power Tachibana uses in for Koizumi every time I hear him. Definitely was a nice change for once in a while. And I did look forward to see this movie for a long time, which was worth it. In the end, it really depends on what your expectations are. I exactly got what I expected, so I did enjoy everything. Hope you will as well. You can watch this movie even if you're not really familiar with the serie but I do recommend at least listening to 1-2 drama CDs to get to know the characters a little bit so that you can enjoy more of it. Hope this was somewhat helpful for you. Thank you very much for reading!